Went back up Mount Baker to look for my lost shoes on the first clear day since my previous trip (August 20, 2012, Mt Baker, Easton & Squak Glaciers), and thankfully Hannah agreed to join me, so that I didn't have to go solo. Somewhat surprisingly, the shoes were still at 9600 ft where I had left them, someone (or something) had moved them a few feet apart, but they were otherwise undamaged. 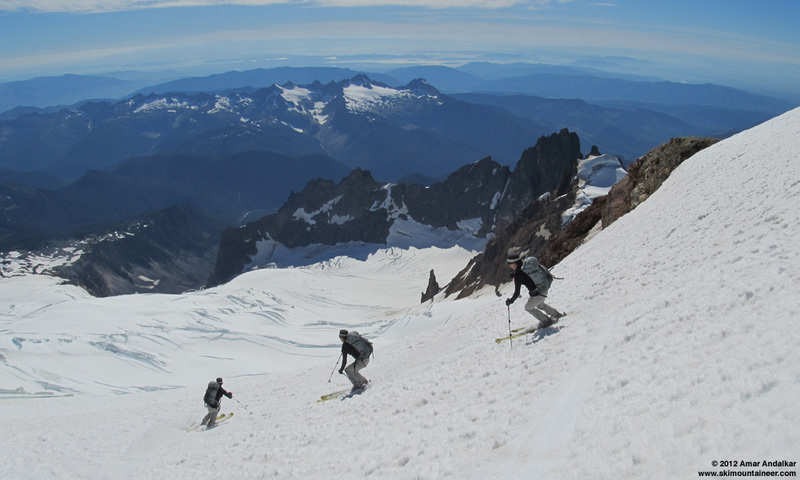 Great to clean up the mountain, get my shoes back, and enjoy another fine August ski descent on the best late-summer ski mountain in the lower 48, certainly among the best late-summer summit ski descents in the world. heiligenschein (some info and more info), on a dew-covered portion of Schriebers Meadow a few minutes from the trailhead. 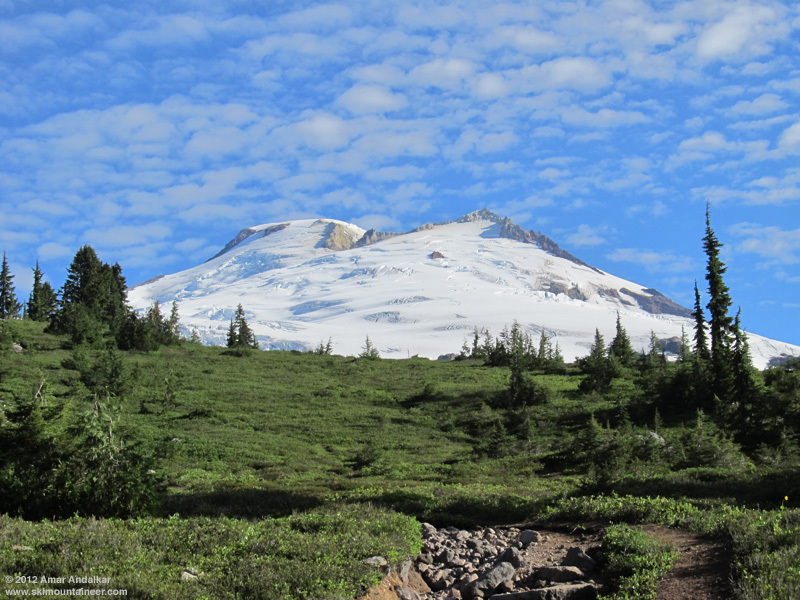 Mount Baker, looking as pretty as a painting (photo has not been digitally manipulated in any way). Four-shot panorama of the Railroad Grade moraine and the terminus of the Easton Glacier. 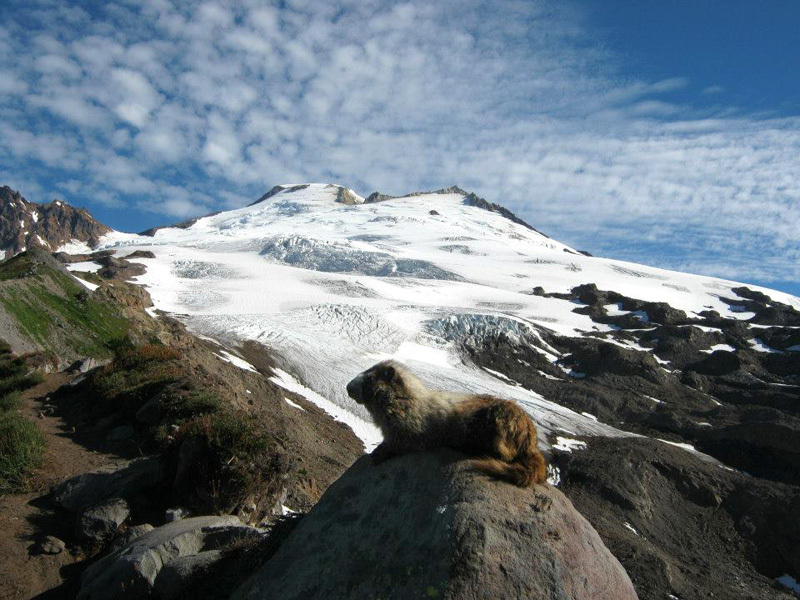 Skinned up from the usual spot around 5900 ft near Sandy Camp, and then cut east across the Easton Glacier's tongue above 6000 ft to where it melds into the Squak Glacier, eventually joining the standard Squak route above 7000 ft. 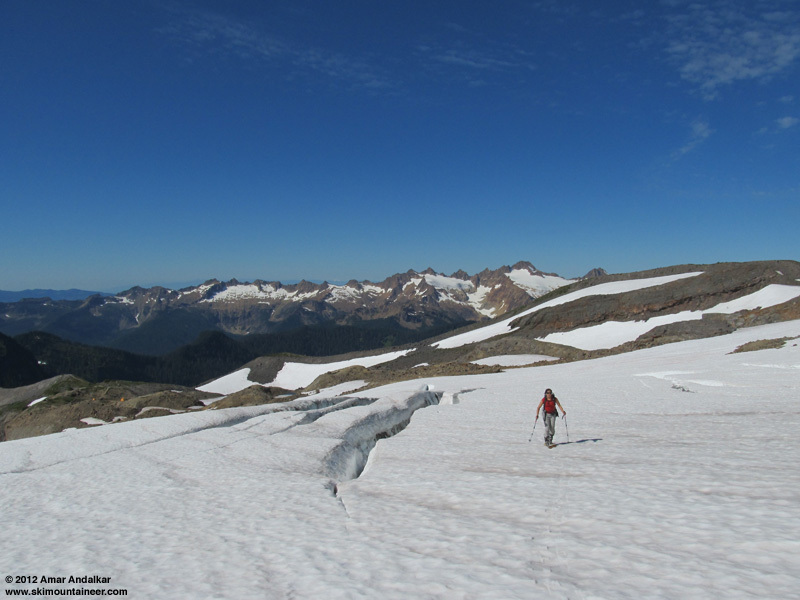 This route (basically the same one I took on August 18, 2010) now offers the safest and least crevassed path to the summit from the normal Easton Glacier camps near the Railroad Grade, via one of the least crevassed sections of glacier on the entire mountain, a smooth wedge between the faster-flowing ice streams of the Easton and Squak glaciers. 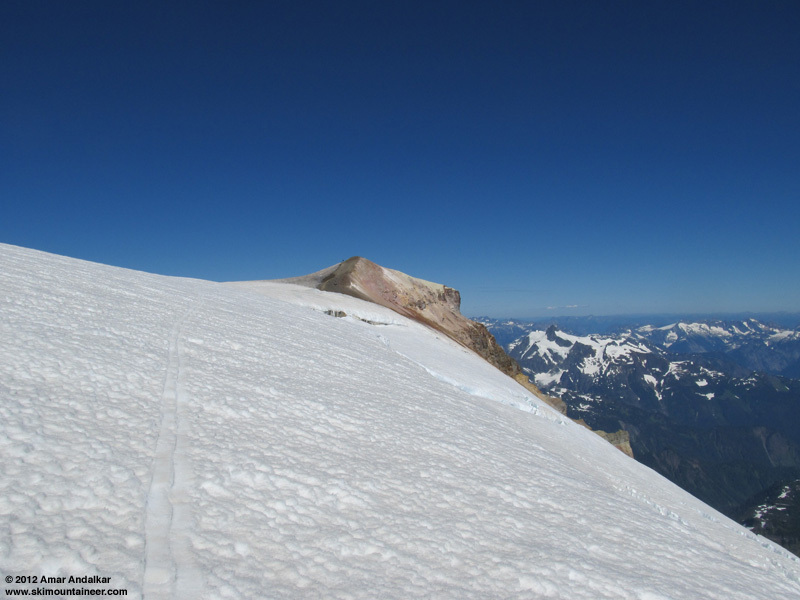 It's a major snowmobile corridor in winter, but climbers never seem to use this variation, no matter how broken the standard Easton route gets in late summer. Not much discernible change on the Squak route over the last 10 days, the crevasses are still a non-issue and roping up was not needed. We saw a pair of other skiers skinning up in the distance near 7000 ft, but they turned around and we never saw them higher up. The bergschrund at 9400 ft just after the Squak and Easton routes join is becoming more convoluted, but is still easily passable. Found my shoes sitting at 9600 ft, just as a group of 6 climbers were descending past us. They said they had wondered how the owner had gotten home barefoot (LOL!). 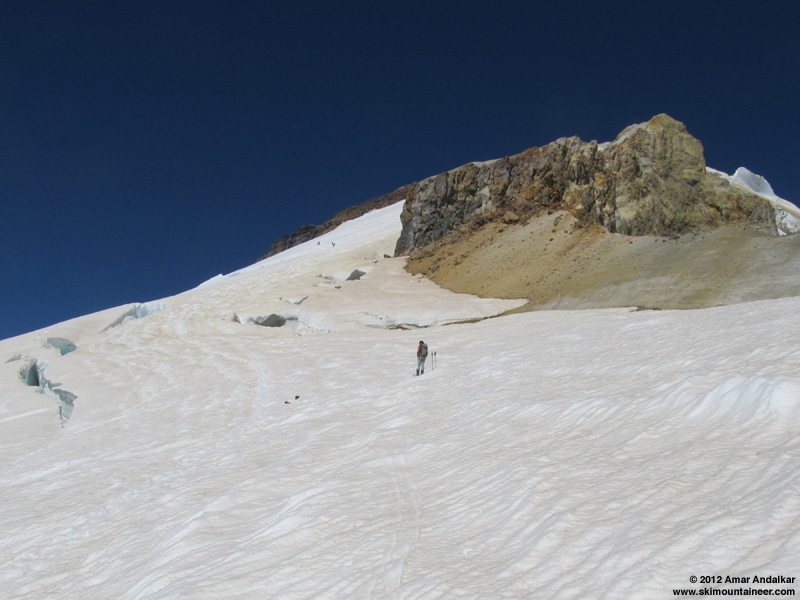 We roped up there and switched to cramponing on foot, and were glad to have the rope on for one crossing near 10200 ft, a snow bridge which is getting sketchier and more thought-provoking than 5 days earlier. A long end-run left is available which avoids this spot entirely, but no tracks were going that way -- but that is the way we skied down. Above those cracks we crossed right to the ridge above Sherman Crater near 10500 ft and skinned the rest of the way to the summit, arriving just after 3pm. 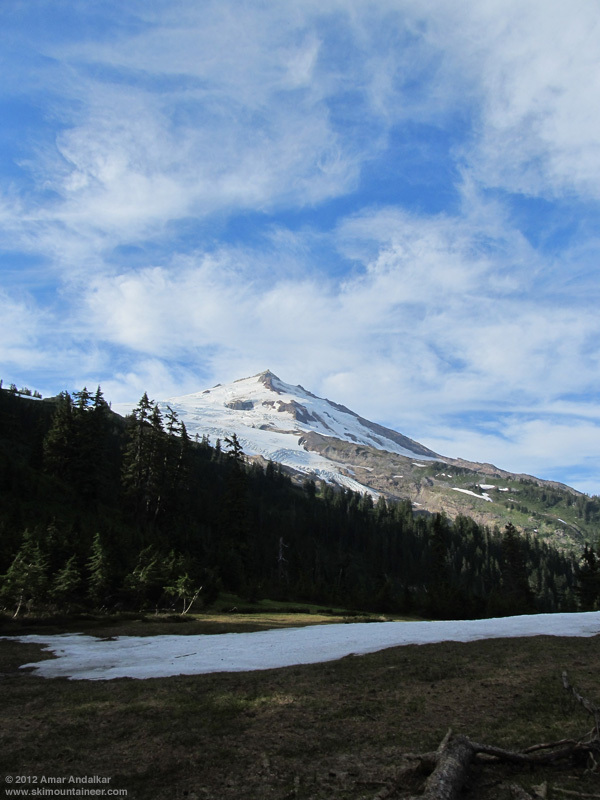 There was a tiny bit of new snow above 10700 ft, a few small patches on the plateau just north of Grant Peak which probably fell 2 days earlier on Thursday, but the old snow on the last 50 ft of Grant Peak was otherwise still extremely dirty. 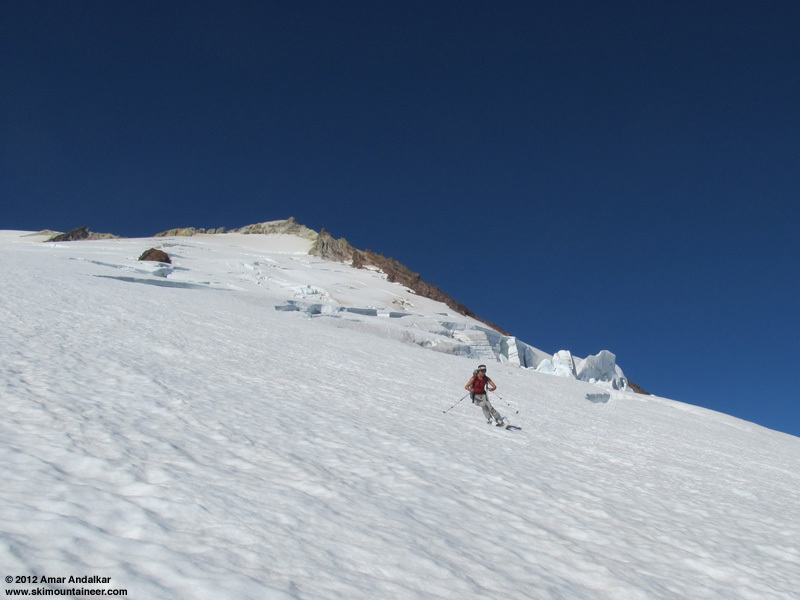 A team of 3 climbers arrived via the Coleman-Deming just minutes after us, they had left their car at 4am (long day!). Another lovely day on the summit, temps in the mid 30s �F with a 10-15 mph SW breeze which made it a bit chilly atop Grant Peak. Skied down around 3:45pm, with nice softened corn on the traverse around the summit dome and down the Roman Wall as expected. Three-shot panorama / multiple exposure of nice corn turns down the Roman Wall. After skiing through the large 2-3 ft deep bumps at the base of the Roman Wall (almost a mogul field now), I made 100% certain to remember to pick up both pairs of my shoes at 9600 ft this time! Three-shot panorama of the Deming Glacier and my shoes. 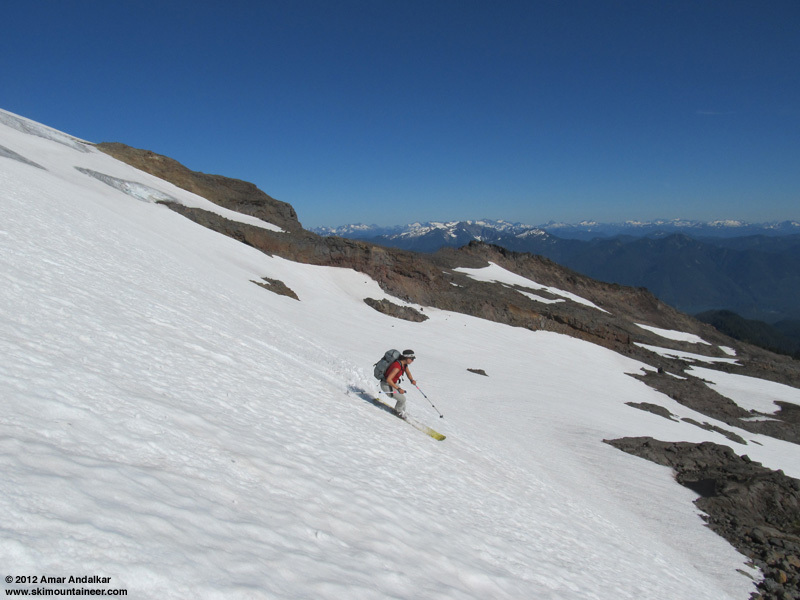 The snow on the Squak Glacier has been getting slightly rougher over the last 10 days, but it still skied really nicely when well-softened. 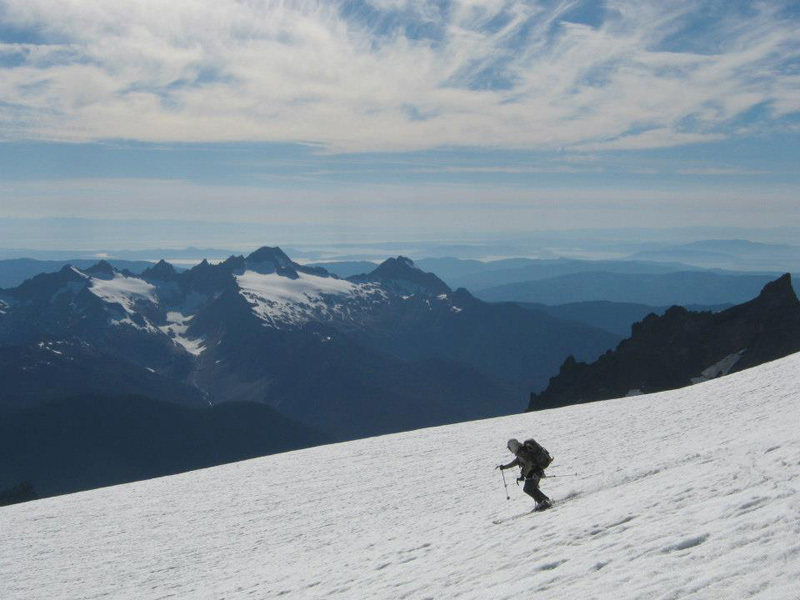 It was merely good skiing in general terms, but great skiing for late August. 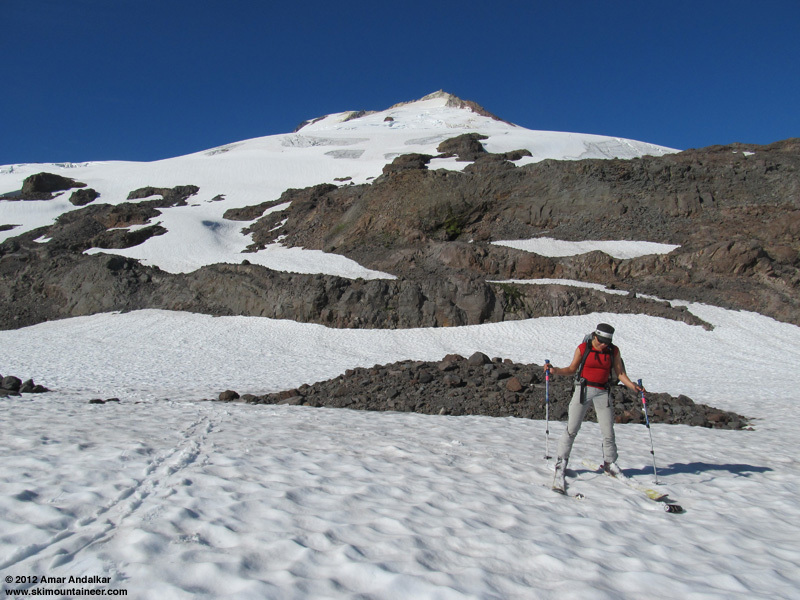 We skied down the Easton-Squak wedge and dropped the steep face at its terminus just east of the large rock outcrop, into the large snow-filled basin below. Hannah picked up a large amount of snowmobiler trash in several different areas: at least 5 beer cans, plus various assorted other small parts and junk. Some people's claims that snowmobilers (as a collective user group) don't litter in the mountains are just patently false, and the likelihood that skiers or climbers deposited this trash up here is near-zero, they just don't tend to travel in that area. Beer cans littering the mountain: two in front of her skis, and a third shining from the rocks behind her. We cut left down the gully draining this area, and rejoined a portion of the familiar glacial stream drainage west of Crag View. We skied down to about 5400 ft with a single short carry near 5600 ft, but skiable snow still extended to the same spot at 5150 ft as my previous 2 trips, if one is willing to make 2 fairly long carries. The hike out was pleasant enough, we got some water from a nice non-glacial stream near 4800 ft. 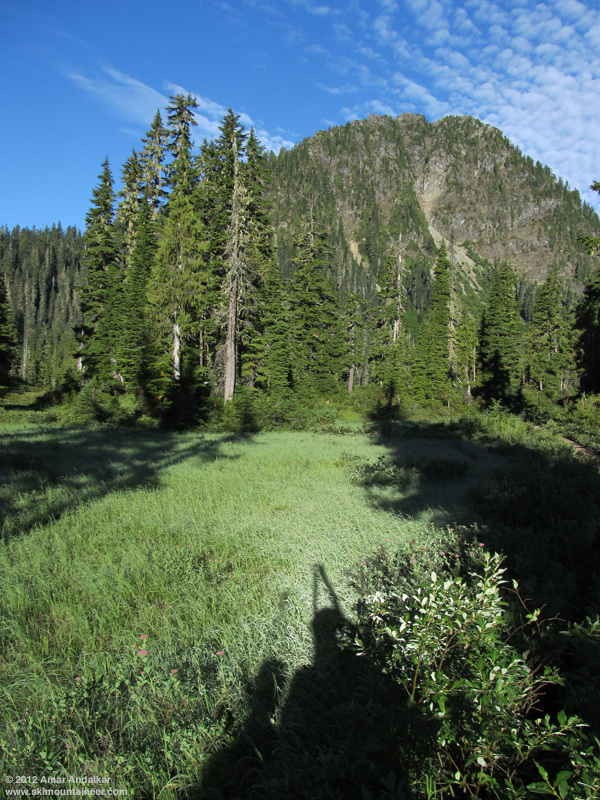 There were still no bug issues at all, barely any bugs along the trail or at the trailhead -- it feels as if the 2012 bug season just never happened on the south side of Mount Baker. There's still a large snow patch occupying most of the saddle near 4600 ft, and a few other large patches visible far below the saddle in the gully. 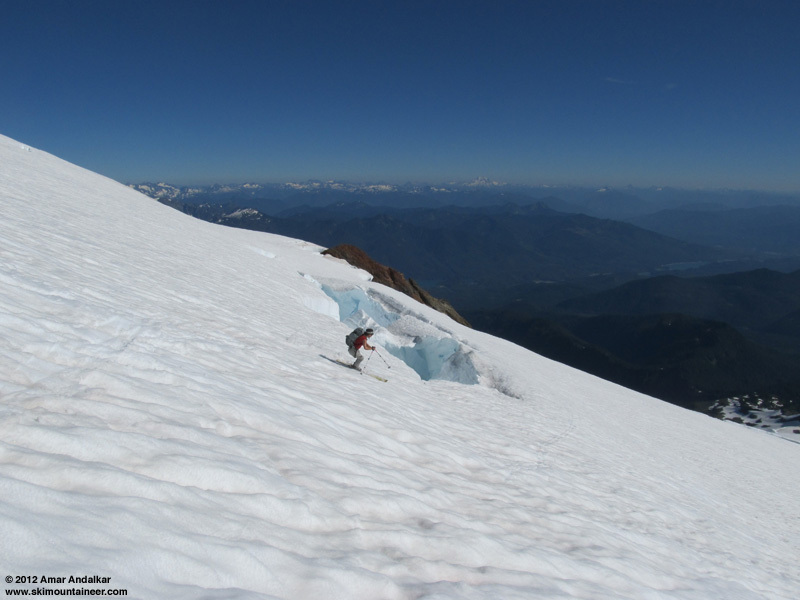 Had a great time on my 4th ski descent of the Squak Glacier and its variations in the past 4 weeks, still enjoying about 5400 vert of fine summertime turns for about 7600 ft of gain. I think it's definitely worth another visit around September 1, and then perhaps significant new snow will start falling above 7000 ft sometime during that month. Nice photos Amar, esp. the multiple exposure panorama. Looks like you're getting used to the new Photoshop.